What Is My Net Worth And How Do I Calculate It? You are here: Home / Save & Invest / What Is My Net Worth And How Do I Calculate It? It’s a common question a lot of people don’t know how to answer. Net worth sounds like a fancy calculation that would be difficult for the average person to calculate. Luckily, that’s not the case. Calculating your net worth is extremely straight forward as long as you understand the components of your net worth. My wife and I have been calculating our net worth every month for a few years now. The insight it gives us into our personal finances is amazing. It’s also neat to look back to see how far we’ve come. Today, we’ll dive into the components and how to calculate them which will allow you to figure out your net worth for the first time. I have a very thorough understanding of these definitions as an accountant, but I realize not everyone else has the same background as me. Fortunately, these aren’t hard to learn. Let’s get started by learning the definitions of assets, liabilities and net worth. Assets are things you own that have value. Another way to look at assets is to think of them as things that you can sell to make money if you need to. The list above definitely doesn’t list every possible asset. Furniture, computers, cell phones, appliances and TVs can also be considered assets. The problem with these assets is their values often begin to diminish rapidly so my wife and I don’t include them in our calculations. You can include them in your calculations if you wish. Just make sure to only include the value you could get if you sold it today, not the price you paid. Liabilities are what you owe other people and institutions, like banks. If you borrowed money to buy a house or a car, then your mortgage or car loan would be considered liabilities. Anything you owe to anyone should likely be considered a liability. This list doesn’t include every liability possible, but it does cover the major ones most people will have. If you owe money to someone or an institution, then chances are you have a liability. Make sure you list all of your liabilities to get an accurate calculation. Unlike with assets, you want to include everything because you’ll have to pay off all of your liabilities, or debt, at some point in the future. 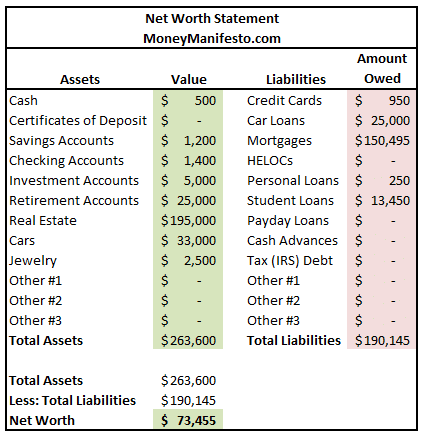 Now that we know what assets and liabilities are, we can calculate your net worth and produce a net worth statement. To start the process, open up a spreadsheet or grab a piece of paper and a pen. Once we’re done, this will be your net worth statement. Next, make two sections, one for your assets and one for your liabilities. Using the lists above as an example of what to include, write down all of your assets and their current value. Then, write down all of your liabilities and the amount you owe for each one. Once you’re done listing your assets and liabilities, add up each category to get a total number for the value of all of your assets and a total number for how much you owe for all of your liabilities. Once you complete the exercise, your spreadsheet or piece of paper might look like the net worth statement below. If you’d like a copy of the excel spreadsheet in the image below, please contact me and I’ll email it to you. Your net worth will tell you how much money you’d have left over if you sold all of your assets, paid off all of your liabilities today and started out all over again with nothing but cash. Realistically, I know that you’ll never sell all of your assets and pay off all of your liabilities in the same day. If your net worth is negative it wouldn’t even be possible. So why do I think net worth is important? Net worth is a benchmark that you can use to measure your progress. The more assets you accumulate the better off you’ll be financially, in general. I say in general because if you’re a hoarder chances are what you consider “assets”, most people probably consider junk… just sayin’. If you’re just getting started in your financial journey, don’t be surprised if you have a negative net worth. You should always strive to have a positive and growing net worth, unless you’re retired, so find ways you can make more money or spend less in order to increase your assets and pay off your liabilities. That said, a negative net worth is nothing to be ashamed of. Everyone has to get started on their financial journey somewhere. Thanks to technology, you can track your net worth every day if you wish. Personally, I wouldn’t recommend checking in on your net worth more than once a month, but here’s how to get an almost automatic net worth number. First, you’ll need to sign up with Personal Capital. Personal Capital is an investing service that offers some amazing and free financial tools regardless of whether you decide to hire them to manage your investments. The free financial tools are what you’ll use to automatically track your net worth every day. First, sign up for a Personal Capital account. Next, link all of your asset accounts including bank and investment accounts. You can also manually add assets for assets that don’t have an associated online account. Finally, add all of your liability accounts. For any liabilities that don’t have an online account, make sure to add them manually. Now Personal Capital will automatically update your net worth every day. You only have to update the values of any manual assets or liabilities you added. You don’t have to worry about linking your accounts with Personal Capital because they use bank-level encryption to protect your information. Make sure to revisit the value of your assets every once in a while. Your car is going to go down in value with every month and mile that passes. To get an accurate value for my car I use Kelly Blue Book‘s private party value. If you own a house it is often difficult to value it. Use your best guess but try not to over estimate. I use Zillow and Trulia to try come up with estimate but understand that it may not work well in your area. Another alternative is to talk to a real estate agent friend or check out how much recent comparable homes in your area have been selling for. Net worth can fluctuate rapidly if you hold a lot of investments and the market is making big moves every day. Try not to get too upset if your net worth goes down a lot one month or too excited if it skyrockets. 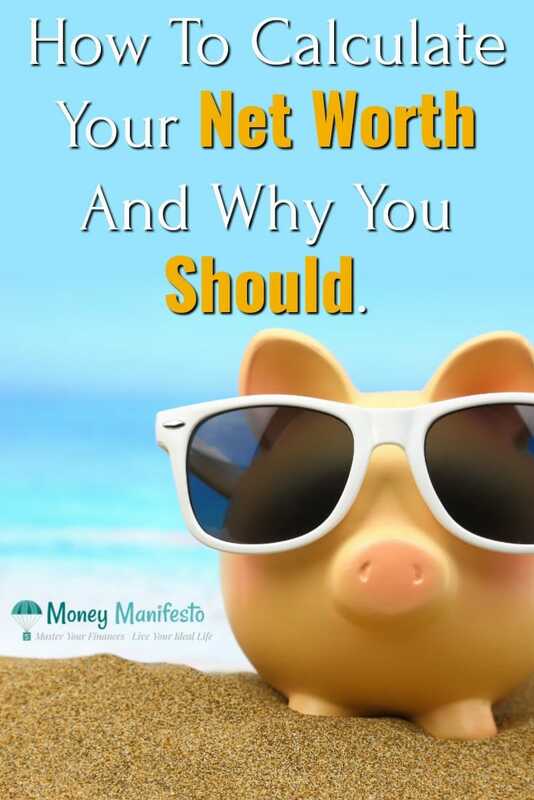 Over time and with some effort your net worth should grow if you are spending less than you earn, are you paying down debt and/or are investing. I track my net worth monthly. Personally, I wouldn’t suggest you track it any more often than that. I use a Personal Capital to track my net worth and update my manual assets and liabilities once a month. Do you calculate your net worth? If not, why not? If so, how often? How do you track it? One quick question: can Social Security be counted as part of asset? I’d say it would be a stretch to consider it an asset. Social security is income and you can’t get it paid out in a lump sum, so I’d advise against it. Would you calculate a government pension of 50K a year into a net worth? Or Social Security? If there are two people, same age, one with 100K in the bank and the other with $0 in the bank, but has a $50K annual pension, who is worth more? So, if we wanted to be really specific and there was a lump sump payout option for the pension, I’d use that in my net worth. However, if you can’t access the money in the pension no matter what, the only way you can value it is the present value of all future payments. Some pensions are rocky these days, which means you’d have to discount it further to put in that risk. At the end of the day, unless you can sell the pension, I probably wouldn’t include it in your net worth. I look at net worth as the money I would have if I sold off all of my major assets and paid everything off. It kind of puts a visible aspect to it that way. It also helps define what I consider in my net worth statement (yes, I add in the value of my cars) and what I don’t (anything around the house basically). I definitely think that thinking about it that way helps determine what should and shouldn’t be in your net worth. I track my net worth quarterly in a spreadsheet. It’s a good indicator of how we are progressing towards our financial goals. It definitely is a good indicator for your financial goals. That’s a great way to look at it. Nope, I have never done the calculation because I already have the idea how much I’m worth, but this time could be different. Seems like a challenge to find out my net worth. I calculate my net worth on an ongoing basis, through Mint.com. I have all my financial accounts linked up there and have my other assets, like my car, manually entered in there (and I keep it updated with Kbb.com values). This enables me to know where my net worth is at on a monthly basis and whether it is going up or down. Great post. I calculate it but I don’t really think too much of it. As long as it’s positive, and I’m on track, then I’m happy. @bog of debt – Even though it is negative now your goal could be to get it to zero! @Kurt – I use quicken but not for my net worth. I don’t use the auto update because I have quicken 2005. @Miss T – Watching it go up is a ton of fun! @Jason – 3-6 months is a good goal. You can do it monthly as long as you understand that investments can vary a lot month to month and not freak out and sell. @Shopping to Saving – It is still an asset though because you could sell it and keep the money. To each their own. @krantcents – As long as you know you’re net worth is going up do whatever works for you. @Maria – That is a great point. If you have a guaranteed pension you should definitely include it. @Fahad – Yup, this could definitely remind someone of economics. This reminds me of my economics classes a year back. Haha. I’ve done this in the past, but only at the beginning of the year so I don’t obsess. I also took retirement accounts off Mint and only look at the quarterly statements–I sleep better at night and the money grows just the same. My networth is almost my religion. In fact I designed a spreadsheet and calculate in every three months – and plot it on a graph. Fascinating exercise. BTW, some formulae include pension funds in ‘assets’ – I do as well because the payout is ‘on its way’ and it will be left if I go. I calculate my net worth when I need it for some form. Normally, I do not think about my net worth too much. For me, it is a benchmark or a measurement of success and I use it to let me know how I am doing. I track my net worth often, but I don’t obsess about it. Plus, I don’t count my car as an asset since my parents bought it for me. I don’t know, maybe I feel like it isn’t really mine. I like to just keep track of my cash and investments as assets (and my future property if I buy one) and then the minimal monthly debt that I pay off each month. My net worth is in the positive right now, so I like it a lot and I don’t stress out about the fluctuations. For the blog I do keep track of my net worth on a monthly basis. However, I typically recommend that my clients update it every 3-6 months. It’s tough to keep track of it monthly because there could often be large swings, especially if you have a lot of investments and the stock market is going haywire. So, updating less often gives you a better idea of how you’re doing in the overall picture. With that said, it’s important to do because it is your financial report card. If your net worth is trending down then you’re obviously not headed in the right direction. We use Quicken to track our finances and it also tracks our networth. We have an update all the time which is great. I love seeing it go up. We’ve been tracking our net worth since 1998, first through Quicken and now through iBank (after Intuit shafted Mac users post-Lion update). These systems produce graphs for any time increment you like–monthly, quarterly, yearly. It’s fun to look back on 15 years worth of data and correlate the ups and downs with external and internal events. I think tracking net worth is important because “consuming” it plus whatever passive and pension income one may have in retirement will dictate standard of living. I haven’t calculated it mainly because I know it’s going to be in the red and I’m not really looking forward to seeing that. I know I will eventually but that’s going to be a ways off. I have never calculated my net worth, but I think I will give it a go just for fun! I guess it would also be a good tool to help with goal setting.